Those on the East Coast got a sneak peek yesterday at the newest LEGOLAND -- scheduled to open in the fall of 2011 in Winter Haven, Florida. 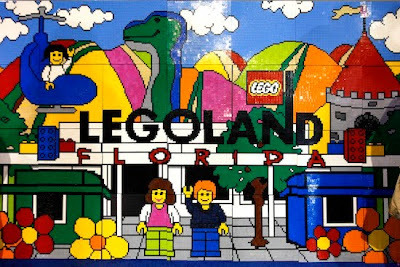 The City part of the park will apparently mirror the LEGOLAND in Billund, Denmark, with a driving academy and Fun Town Fire Academy, where you pump an oversized LEGO fire truck down a lane to put out a "fire." It's good to know the Dragon rollercoaster will also be at the park in the Castle area. It's one of the only rollercoasters in the world that I know I am brave enough to ride. Image courtesy of Orlando Attractions Magazine.